In September, many teachers in the flipped learning community participated in a "challenge" put out there by Andrew Swan (@flipping_a_tchr) via Twitter: the "20-over-30 September #flipblogs challenge". There were many great posts made as part of the challenge and as we head into October, we're going to share a few more of them that we didn't get to in September. See Joy's first entry here for some context and a little more information about the challenge. And oh yeah - now there is a new "Weekend at Flipblogs" challenge (less taxing) to participate in! I train students to watch the microvideos for a flipped class through a process that gradually gives them skills they need to access them on their own. Step 1: discuss in general how to successfully learn a skill from a video, by watching a video as a whole class and then thinking through strategies we used (or could have used) to learn from it as effectively as possible. Step 2: practice watching an instructional video as an individual, in class, able to control its pace yourself. Step 3: introduce an accountability method for checking who's watched the microvideos and/or otherwise done the pre-class work, release the responsibility to the students for watching the videos on their own time, and help the students rock the new routine. My grade 9 classes were taken through step 1 on Tuesday -- that was the origami butterfly video experience I previously described. Getting a video recorded Tuesday after school let me put those classes through step 2 on Wednesday. try the textbook practice questions mentioned in the same Classroom post, including a couple of questions that required some graphing on grids I provided as a handout. I told the students I would be checking the next class to see if they had completed both some notes and the practice work. a lot of students either don't have earbuds/headphones with them in class, or chose to play the video through the computer speakers instead. I've noticed this tendency more in the last few years than when I first started trying flipping -- unfortunately, I remembered this too late to look into ordering some bulk cheap earbuds for use with my classes. The noise of overlapping videos playing from different computers wasn't insane, but it was distracting enough that my hard-of-hearing student asked if she could view her video at a desk in the hall. if you're going to use intro music, choose carefully, or be prepared to hear it over and over again. I used a free short clip from https://audionautix.com/ that I've used before -- a short piece called Comical Banjo -- and some of the students thought it was so funny that they kept restarting the video just to play the music. My afternoon class didn't seem to have this issue (nor did the grade 10 students who had to watch a different video that used the same tune in class last year, and they were also a pretty silly group). I was surprised how many students I had to speak to about this. "Miss, that's you in the corner!" "How many subscribers do you have?" While the students watched, I circulated among them to make sure they were taking notes, that they were understanding the video, and that they knew what they were responsible for once the video was over. 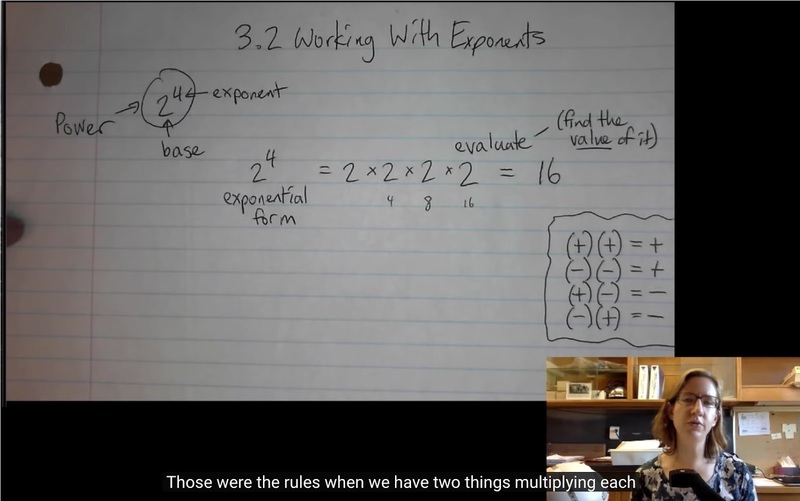 The topic was an easy one (working with exponents -- remember, one point of today's video was habit-training rather than complex math skills), so some students resisted taking notes at first, but I asked them to do so this time anyway. At least two of the students also flagged me down to clarify something I said in the video, with questions that showed they were really thinking about it. I have heard the term "in-flip" or "in-class flip" used to describe this style of class, in which students often get direct instruction through videos they watch during class time before proceeding with other assigned activities that build on the video's ideas. While I prefer to have students watch my videos outside of class time, to allow more time for group space activities, I know the "in-flip" is helpful when even assigning video-watching is forbidden by a district's no-homework policy, and it can also work as a solution for particular groups of students. On Thursday, my students were in and out of the room a lot as they were called down by last name for photo day, so it was a good day for something students could do individually rather than a whole-class lecture. While the students worked on an investigation (to draw out the rules around multiplying and dividing powers with the same base, and the power of a power), I called up each individual student in turn to check that they'd done yesterday's work, to get their feedback on the clarity of the video, and to see if they'd had any problems with the work. Through those check-ins, I was able to talk to every single student. No one could hide, and no one could be overlooked. I was able to spot a pattern in the questions the students found difficult. A student I'd had a negative interaction with earlier in the period responded much more positively as I showed him how to access what he'd missed when he was absent Wednesday. I was able to get specific feedback from my hard-of-hearing student as to what was helpful from the video. When Jonathan Bergmann and Aaron Sams published their book Flip Your Classroom, they subtitled it Reach Every Student in Every Class Every Day. When I was first introduced to flipping classes, the teachers using it told me they were able to talk to every student in their classes every day, and that was one of the hooks that got me interested in checking it out. It's the reason why the Flipped Learning Global Initiative has now called its conferences RESCONs: Reach Every Student Conferences. Like I said in my first post in this challenge, I believe the relationships I build with my students play a key role in how they will do in my class. I'm glad even doing this in-flip has given me a chance to work on those relationships this week. *Besides, Swan himself may not get to 20, either ;). The possible revision of the challenge is a moving target I can hit!